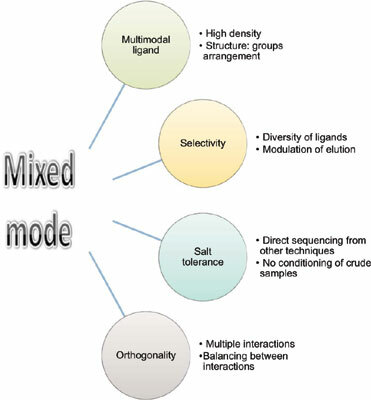 Mixed mode chromatography offers a diversity of ligands, each providing a new selectivity. This allows the design of novel purification processes with reduced column steps. Structure of ligands is based on both hydrophobic and ionic groups. Thanks to its salt tolerance, crude extracts or post-IEX samples can be loaded directly without conditioning. The selectivity could be enhanced by modulating elution parameters or by using additives. More importantly, mixed mode chromatography could be as effective as affinity chromatography for mAb purification processes. Mixed mode chromatography opens the way to short and economical processes. Mixed mode chromatography, multimodal chromatography, selectivity, protein purification, ligands, additives.